But there was plenty of action, thrills and spills along the way over eight games on Saturday. The defending champions laid down a marker of intent, Andy Moran kept his nerve to guide Ballaghaderreen to a come for behind win, Neil Douglas recused Castlebar at the death and that’s only half of what happened on the day. The action got underway early in the afternoon in group one in Bangor Erris where the home side managed to score just a single point in the second half and still hold on for the win against Bohola Moy Davitts. Kiltane manger Ciaran O’Hara told this writer after the game that he had never seen wind like it for a game there before. His side opted to play with the aid of it in the first half and build up a 0-6 to 0-4 lead at the break, with a brace points coming from each of Mikey Sweeney, Adam Carrabine and Tony Gaughan their reward for dominating possession. They did put seven efforts wide of the target and it looked at the break that if Moy Davitts could get the kind of possession that their hosts had they would have a really good chance of picking up the points. Their first half scores came from Padraig Ruane, Brian Heneghan, Liam Byrne and a Brain Reape free. The second half returned just three scores to the scoreboard with Adam Carrabine’s free on 36 minutes his sides last bit of business with the scorekeeper for the day. Much like their hosts in the first half the wide tally for Moy Davitts in the second kept creeping up and up and it took them 22 minutes into the second half to register their first score of the half through a Conor Byrne point, two minutes later Brian Reape put over a free to cut the gap to the bare minimum and it was going to be a battle to the end and the home side gritted it out to much celebrations from their faithful. On target: Tommy Reilly got on the scroesheet for Breaffy. Photo: Sportsfile. In the other game in group one last years beaten finalists Breaffy saw off Davitts by six points in Ballindine. Despite being named in starting 15 Matthew Rune was did not start for Breaffy and neither did Seamus O’Shea who is recovering from an ankle injury picked up in Mayo training in early March. The homeside had the wind advantage in the first half and they put it up to their hosts going in trailing by just a single point at the break on a score of 0-4 to 0-5, with the teams going point for point after Daire Morrin’s opener until Liam Irwin kicked the ninth point of the half before the break. Ronan McNamara kicked two frees for Davitts in the first half with their other scores coming from Michael Conroy and Keith Prendergast. Liam Irwin hit three for Breaffy with Tommy O’Reilly adding the other for Breaffy. In the second half Peter Ford’s men took over and pushed themselves out to a 0-10 to 0-4 lead at one stage thanks to points from Rory Martyn, Tommy O’Reilly, Daire Morrin and two more form Irwin. 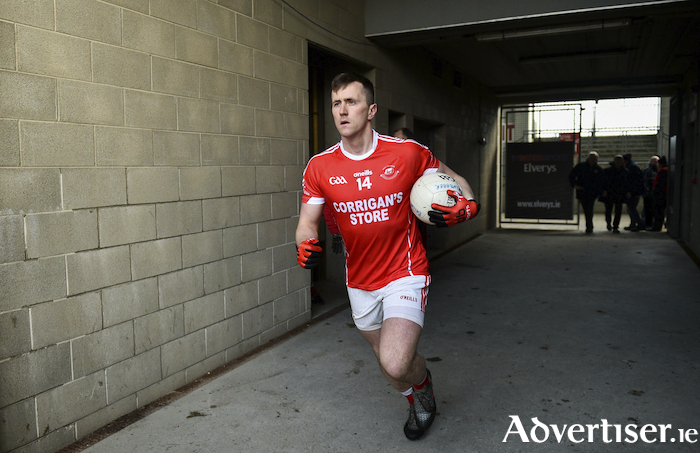 Colm Boyle cut the gap bak to five - but the next score was for Breaffy from the penalty spot from the boot of Stephen McDermott to kill off the game as a contest. Davitts did add two more points through Keith Predergast and Cathal Hennelly, but it was a cast of job done for Breaffy. Not for the first time Neil Douglas was the man to come up trumps for Castlebar Mitchels when they needed him. The Castlebar attacker wasn’t going to be missed on the field sporting a bleached blonde hairdo and he kicked two points at the death to see Castlebar secure a point against a brave and battling Ballina Stephenites side. The north Mayo men played with the aid of a strong breeze in the firs half and went in leading 0-5 to 0-4 at the break and it looked to most that they were going to need a bigger lead if they were going to pick up the points against one of the title favourites. Conor Newell and Ciaran Tracey hit a brace of points and Keith Tighe landed one for Enda Gilvarry’s side - with David Stenson kicking two in response for Mitchels and James Durcan and Neil Douglas adding one each for Mitchels. Shane Hopkins levelled it up early in the second half and James Durcan edged Declan Shaw and Eamon Smith’s men in front and it looked like Mitchels were about to take control of the game. But it was the north Mayo men who would strike for home Ciaran Tracey took a shot that tailed off target but it was kept in play Sean Regan who came on as a half time sub and put in a excellent 30 minutes. He fed the ball across the face of goal and Luke Doherty was on hand to finish it to the net. Douglas and Stenson hit back with points for the home side to level it up at 0-8 to 1-5, but Ballina were not going to be pushed off their game with Mikey Murray putting an inspiring shift in the middle of the park, before injury forced him off. Evan Regan kicked three big points and Luke Doherty added another and they were leading 1-9 to 0-8 with seven minutes left on the clock. Mitchels though showed they are made of tough stuff and they kept their composure, Douglas brought it back to a three point game, then Paddy Durcan sliced in and drove a point over the bar that could have ended up in the back of the net to leave just two between the sides. Douglas then landed a long ranger to leave just the minimum between the sides and as the game moved into the final stages of injury time the same man was on hand to arc over a levelling point and share the spoils. The other game in the group also ended as a draw with Aghamore and Westport finishing up 1-5 to 0-8 in Aghamore. The hosts led 1-4 to 0-2 at the break with visitors outscoring them 0-6 to 0-1 in the second half. Whoever fancies a crack at Ballintubber’s crown have been warned the defending champions mean business - the Abbeysiders traveled to ‘The Saucer’ in Hollymount and left with not only the points but a big win on a scoreline of 0-18 to 1-3. They; hit nine points in each half and kept Hollymount-Carramore to just single score in the second half, but most attention will be paid to this game because of the return to action for the first time since last year of Cillian O’Connor. He came into the game as a second half sub, scored a point and was unlucky not to have grabbed himself a goal along the way too. Stephen O’Malley was top scorer for the ‘Tubber with five points, while veteran Alan Dillon put in fine showing finishing up with three points as did Mayo captain Diarmuid O’Connor. Darkness was closing in around Knockmore by they time their meeting with Garrymore concluded on Saturday evening, while the football was far from entertaining at times, with both sides playing with massed defences and working the ball through the hands time after time and making little progress - that’ll matter little to the homeside who deservedly ran out 1-9 to 1-5 winners in the biting cold. Ray Dempsey’s men played with the aid of the breeze in the first half and went in leading by 0-8 to 1-1 - Keith Ruttledge lead they way on the scoreboard for them with three well taken points, along with a brace from Peter Naughaton and scores from Aiden Orme, Darren McHale and Colm Reape. Garrymore were trailing 0-3 to 0-1 when against the run of play they hit the back of the net 11 minutes in when Brendan Cunningham got in to pull on the ball on the deck after a Shane Nally free dropped short in the Knockmore danger area, their other score of the half came from Trevor Nally 29 minutes into make it a 0-6 to 1-1 game, but Knockmore were able to tag on two more scores before the break to go in leading 0-8 to 1-1. The second half was more of the same just in reverse with Garrymore dominating a lot of the possession but not converting it. They had the gap back to a single point with 12 minutes to go thanks to a brace of points from Trevor Nally and one from Mark Tierney and looked to have the momentum with them - but it was Perter Naughton who hit the next score of the evening with ten minutes to go. Gary Golden did bring it back to a one point game on 55 minutes - but right on full time Darren McHale found the back of the net after strong run by the impressive Tom Clarke who drove Knockmore all evening in the middle of the park and that was that. An injury time Andy Moran penalty saw Ballaghaderreen take the points at home to Claremorris on Saturday evening. The home side trailed by 0-11 to 0-3 at the break with James Shaughnessy leading the charge for Claremorris on the scoreboard and Andy Moran hitting all of Ballagh’s three scores. Claremorris managed to hit just 1-1 in the second half, but were still leading at the death until the east Mayo men were awarded a penalty and Moran made no mistake from the spot for last years beaten semi-finalist to get their championship season up and running. The other game in the group saw both sides not scoring in a half each, but it was the hosts in Belmullet who managed to do the most damage when they had the elements leading 0-8 0-0 at the break. Cathal Barrett and Shane Nallen both scored three points with Gary Barrett and Kieran Conroy getting one each. Charlestown did march back into in the second half with Colm Maye kicking a number of placed balls, but it wasn’t enough as last years intermediate champions took the points in their first game back up with the big boys.